This article was first published by Seedstock.com on April 30, 2013. The Reinitz Family of East Henderson Farm. The family farmer is making a comeback with a starring role in the new American dream. In recent years, the number of individual farms in the United States has increased for the first time since World War II, according to the 2007 Agricultural Census, the most recent data compiled by the USDA. 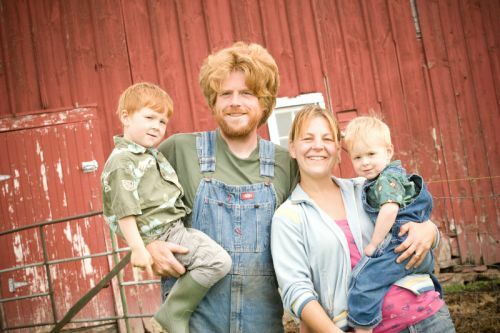 A new wave of beginning family farmers have headed back to the fields, driven by a desire to connect with the land, frustration with the industrialized food system, and high unemployment rates. The majority of new farms are very small, earning less than $10,000 per year. They tend to be run by younger farmers, two thirds of whom rely on off-farm work to supplement farm income, the census revealed. As with any new business venture, it can take several years to begin to turn a profit. Even then, margins are slim and risks are high. These are not exactly favorable investment conditions. However, despite massive barriers to entry, a high level of risk, and the promise of an uncertain financial future, something is drawing new farmers to the field. For some, like Marty Travis of The Spence Farm in Livingston County, Illinois, farming offers something else, a chance to experience “purposeful living and purposeful work.” Rather than pursue the conventional model of petroleum-based monocropping, he and his wife Kris have joined a growing movement that seeks to reconnect consumers with the land through local, sustainable, diversified farming. Like many of today’s beginning farmers, the Travises got their start as part-time farmers, cultivating just a single acre of their farmstead. Today the couple and their son Will work 50 of the farm’s total 160 acres, raising American Guinea Hogs, growing Iroquois White Corn, tapping maple syrup, and harvesting wild paw paws. When the Travises planted their first acre in 2004, they knew very little about the business of farming, even though The Spence Farm had been in Travis’ family for eight generations. His parents had never worked the land themselves, opting to lease much of the property to tenant farmers. That meant that like many of today’s beginning farmers, the Travises did not have generations of family farming knowledge and industry relationships to tap into for their own farm business. During much of American farming history, knowledge passed down almost exclusively from father to son. However, in the last half-century, many farmers’ children have opted to head for cities and suburbs rather than carry on the family farm. Many of today’s younger generation of farmers striking out a new path like the Travises have encountered a steep learning curve associated with each crop and every animal. Likewise, the business of farming comes with its own series of trials and pitfalls, right from the start. Many would-be farmers find themselves stuck at the beginning, unable to access land or credit, explained Jennifer Fahy, a spokesperson for Farm Aid, the annual benefit concert turned family farmer advocacy organization started by musician activists, Willie Nelson, Neil Young, and John Mellencamp. Fahy has seen a dramatic increase in interest in small farming, which she attributes to the local food movement and rise in popularity of farmers markets and CSAs. “There is so much interest in folks getting in touch with the roots of their food and so they are inevitably getting interested in farming themselves,” she said. However, the business plan of diversified farmers like the Travises can be unfamiliar to bankers in charge of start-up loans, Fahy said. Farm Aid helps to connect farmers to alternative funding resources such as new microloans for beginning farmers from the USDA’s Farm Service Agency. Similarly, access to available, uncontaminated, and affordable land can be a serious challenge for new farmers, Fahy said. She relayed the story of one Massachusetts farmer profiled on the Farm Aid website who resorted to borrowing multiple plots of gardens in several different communities because she could not find a single parcel of land for sale. Lindsey Lusher Shute of Clermont, New York can relate. After farming two separate parcels of rented land in the Hudson River Valley for six years, she and her husband Ben realized that they needed to find land that they could secure for the long term if they were going to maintain careers as farmers. The couple looked for land to buy but found that “there was no room for a long-term farmer to find land.” They grasped for a community organization to help them with the process. Finding none, they teamed up with another local farmer struggling with land issues and formed the National Young Farmer Coalition to connect young and beginning farmers in 2010. The Shutes are not the only beginning farmers starting to organize. “It turned out that this idea of young farmers and beginning farmers needing each other and needing to cooperate and work together and find a way to succeed together was happening nationally,” Shute said. Several regional young farmer organizations popped up at the same time as NYFC and have since joined as regional chapters. Back in Illinois, the Travises established their own community network and reached out to other farmers to create a community network of small farmers that could learn from each other. “There used to be the infrastructure where folks did work together, but as we quit growing food and went to more conventional corn and soybean crops everyone ended up on their own,” Travis said. He and his wife began reestablishing those community connections as fledgling farmers. Just one year after starting their own venture, the Travises established a foundation, which organizes workshops on the business of farming, farm machinery options and sustainable practices. They formed a network of 25 farmers to collectively negotiate wholesale contracts and insurance. However, even with supportive farming networks, farming will always be a risky business. Farms don’t come with 401K packages, sick-time, or even health insurance. Risk is embedded into every aspect of the operation. Crops fail, livestock get sick, and machinery breaks. Even though the market for locally grown produce continues to expand, many local farmers still struggle to eek out a living. A recent story on National Public Radio’s All Things Considered declared, “Local food may feel good, but it doesn’t pay.” The program highlighted several local farmers in Illinois, who said they constantly struggle to make ends meet, despite the local food boom. One farmer talked about supporting two people on less than $30,000 per year. A flurry of comments on various social media sites declared the financial challenges depicted in the piece to be “a familiar story.” However, others suggested that the kind of success many local farmers seek cannot be encapsulated in a salary. The Travises, Shutes, and Reinitzes version of success is more abstract than profits. In the words of Sally Reinitz, “I feel that we are successful if we can leave something for our children, not just the farm, but the seed to be better stewards of the land.